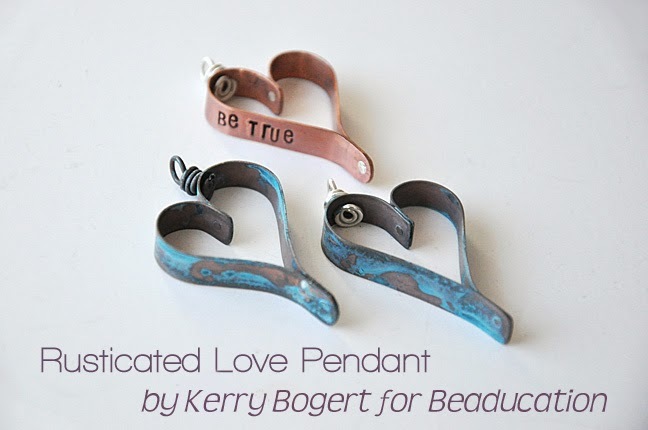 Our kind and talented friend, Kerry Bogert of Kab's Creative Concepts, is our guest blogger today and she is here to teach you how to make this gorgeous pendant. 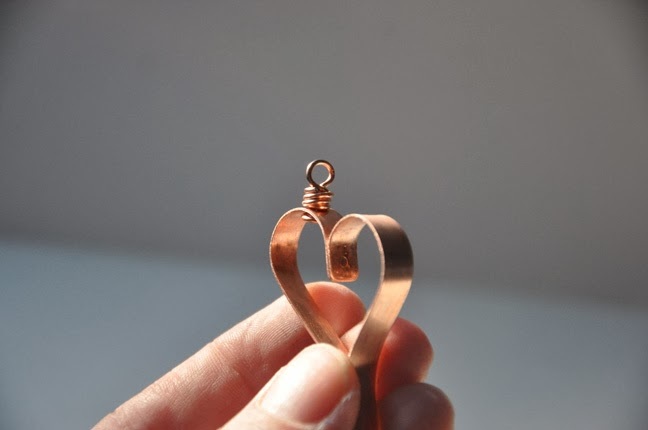 This project includes riveting, metal shaping and stamping... all of the things we love! Hi gang! I am very exited to share this project with you here on the Beaducation blog. Before I begin with this project, I feel I need to confess something: until the summer of 2012 when I attended Bead Fest, I seriously sucked at riveting and I totally avoided it. Despite all the how-to books on my desk and online tutorials at my fingertips, I just couldn't figure it out. My rivets were never the right size, half the time my metal pieces came apart, and one side would end up flatter than the other. I spent just a few minutes at the Beaducation booth watching Aisha Formanski demonstrate how she rivets and I became completely enlightened. Aisha is a riveting maven, and in this tutorial I'll share here a few of the things I picked up by watching her. 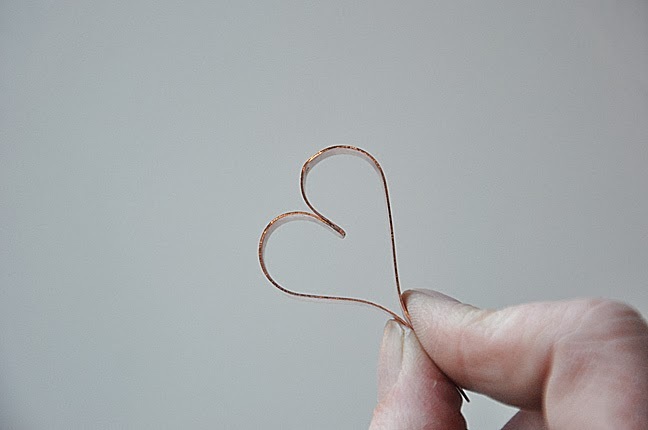 Oh… you should also know that I was inspired to make this heart form after seeing this garland tutorial from Pinterest. 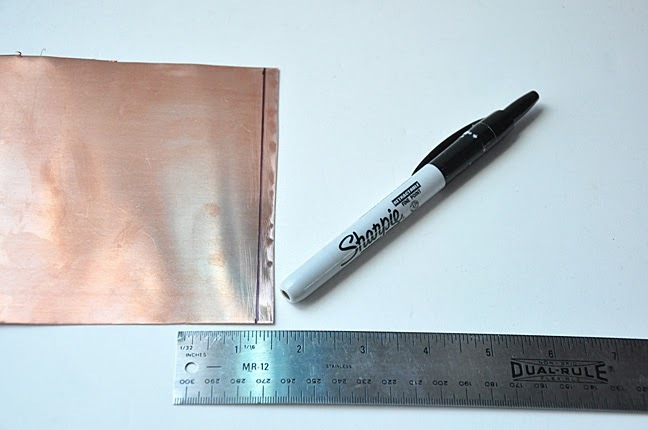 Begin by marking off a 1/4" (6mm) strip on your copper sheet metal (of course, you could use brass or sterling as well) that is at least 5 1/2" (14cm) long. 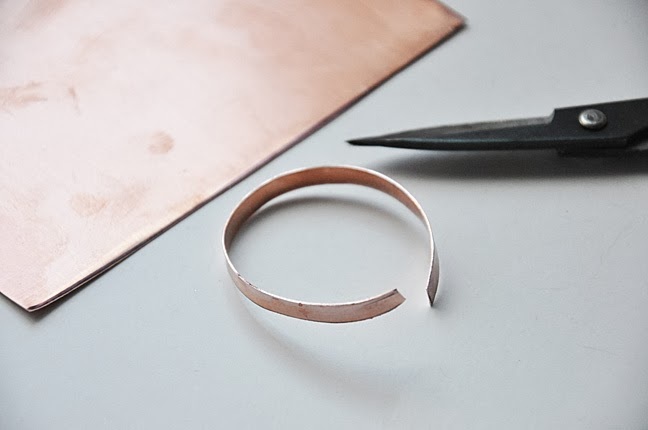 Using metal sheers or a jeweler's saw, cut your 1/4" (6mm) strip from the sheet. 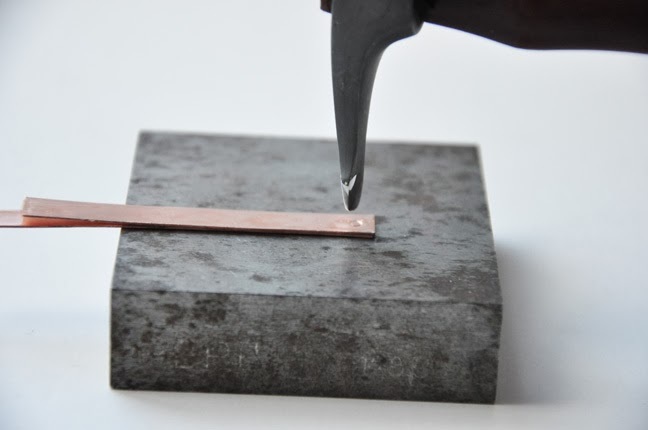 The following step is near the top of the list of important details: you want to spend some extra time filing, sanding, and softening the edges of the metal. This finished pendant will be against your skin and it is incredibly important that the edges are not sharp. Beaducation’s sanding sticks are great for this! 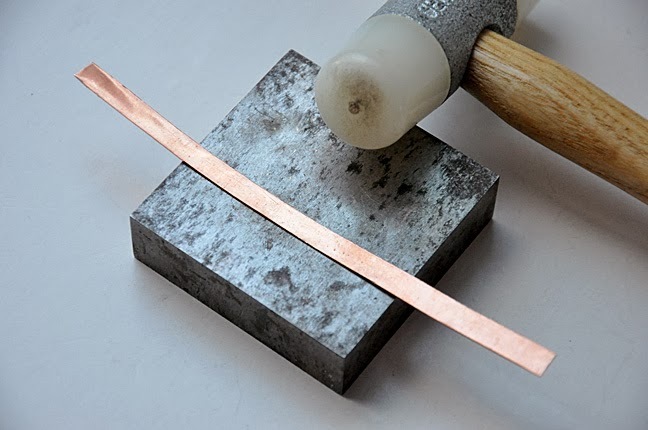 Once you've smoothed the metal, cut it into two pieces: 3" (7.5cm) and 2.5" (6.5cm) long. You can leave these ends raw and unsanded for now; we’ll fix that later on. Line up the two clean/sanded ends and hold the two pieces together as one. 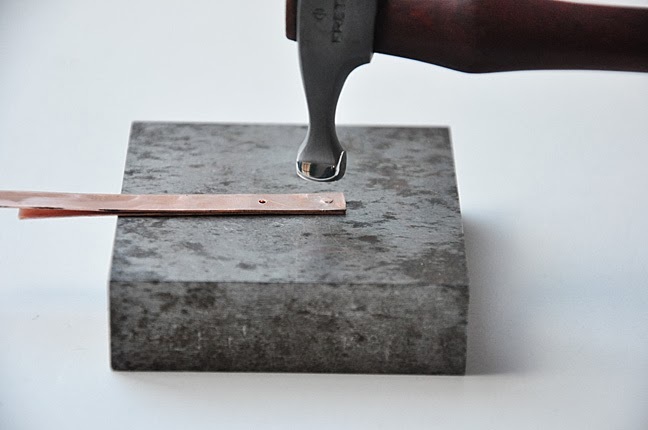 Mark a hole that is 1/8" (3mm) from the cut end and while holding both pieces together, punch through both layers of metal. 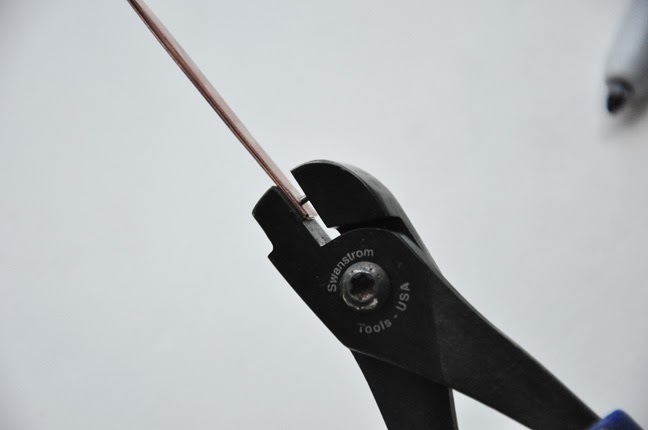 If you are using flat wire and not the thinner sheet, your punch may not be strong enough and you might have to punch the holes separately. 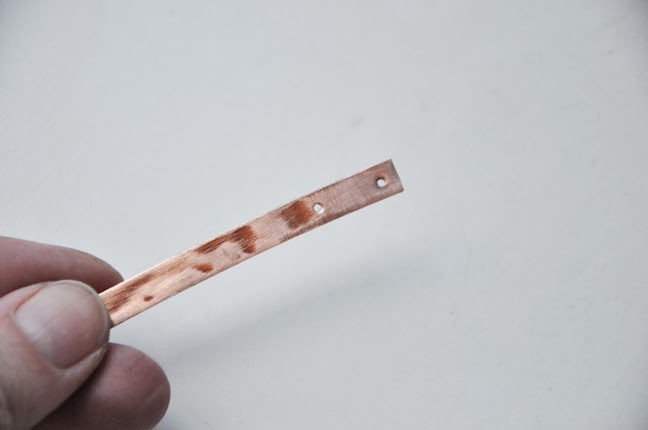 Punch a second hole in the longer piece of copper strip about 1/2" (1.3cm) from the first. You aren't punching this one through both pieces, just the longer one. Flip all the pieces over and file down any high ridges that have been left behind by the punch pliers. In the picture at the top of this post, you'll notice I stamped the words "Be True" into one of the metal strips. I did that at this stage of the project -- after punching the holes and before riveting them together. 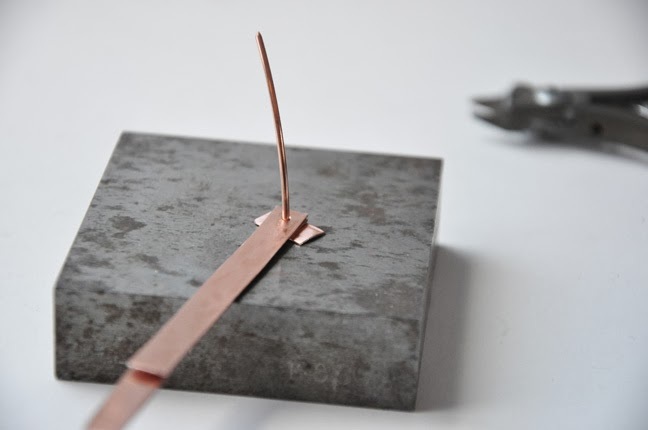 Now we are going to cut a piece of 16g wire and use it to create a rivet. You'll see that under my layers of metal is a small scrap piece of 18g sheet. This scrap piece has a hole punched in it, same as the others. I stacked the 3 layers together and have my 16g wire going through all the layers. 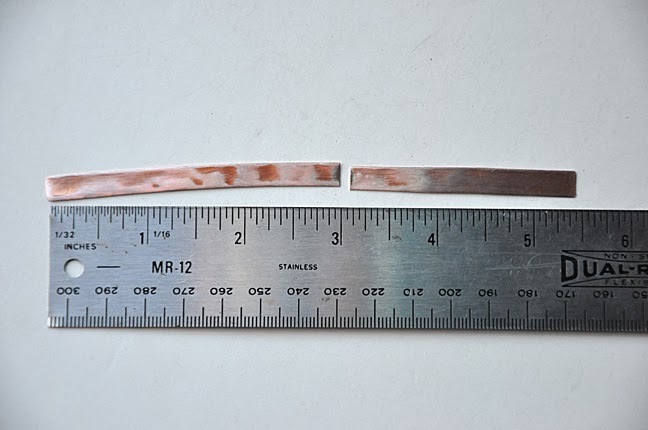 That scrap piece is going to make this cut just perfect (18g is 1mm thick). Flush cut the wire. 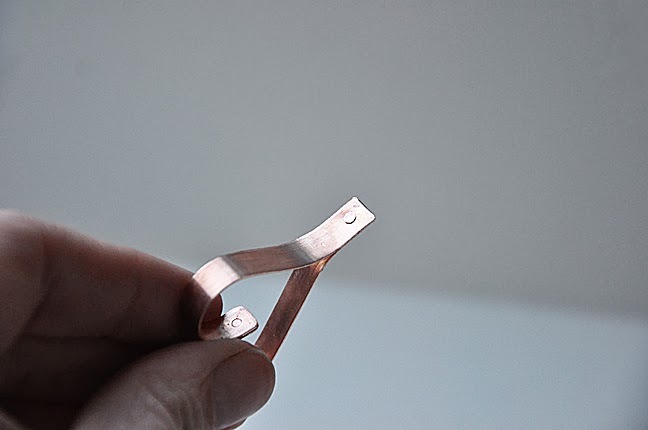 When you remove the scrap piece of metal, you will see you have a teeny-weenie piece of wire. 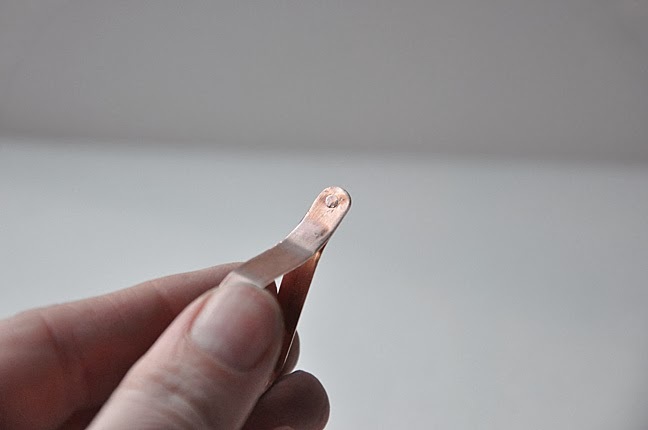 This will be your rivet wire! That's Aisha-gleaned tip #1. In the past, I have tried to rivet by guesstimating and cutting the wire that I hoped was a few millimeters longer than the two pieces of metal when held together. My pieces were always too long or too short. This trick really works -- try it! A lot just happened in these two photos... I'll explain. I used to think that I could get away with making rivets with my chasing hammer. I admit it, I was wrong. A riveting hammer really makes a world of difference. I started by using the chiseling end of the hammer, that's the narrow ax like end. I lightly tap-tap-tapped across the top of the wire. Then, I flipped the two pieces over and lightly tap-tap-tapped on that side. Then, I flipped it over and repeated. Very soon, I could see that my rivet was widening out and starting to take on a mushroom shape. Once that mushroom was formed, I flipped my hammer over to the square side and started to hammer the mushroom flat. Don't rush it, and don't completely flatten one side at a time. Instead, a few taps on one side, flip it, a few taps, flip, tap, flip, tap... until the rivet is flat. That’s tip #2 from Aisha. When done, you should be able to run your finger over the rivet and hardly know it's there. 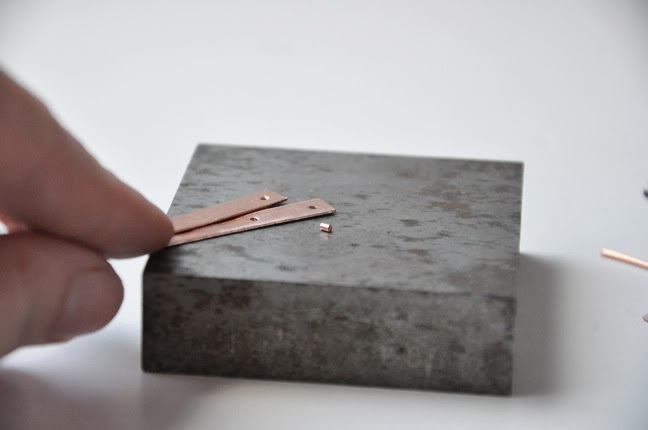 You can file and sand the corners of the metal strips for a more rounded look. 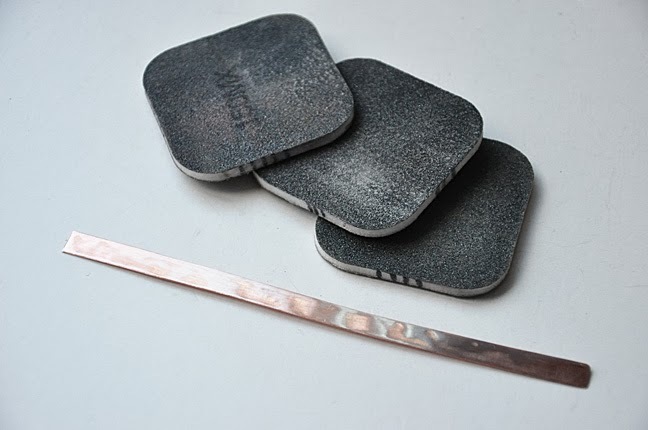 Start to fan out the free ends of your riveted metal strips by gently pulling on them. 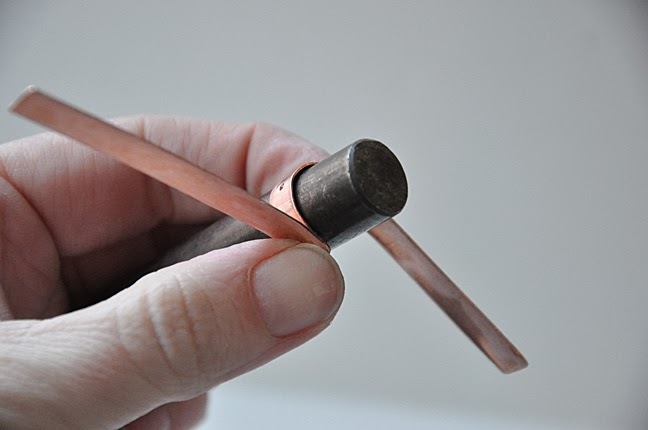 Wrap each side around a round mandrel. 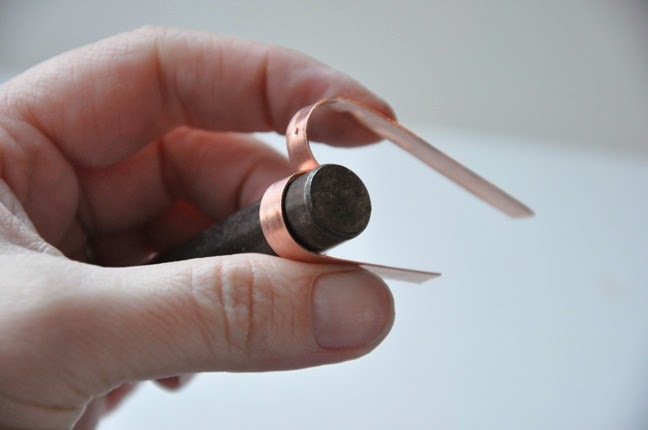 I used one of my dapping punches as a mandrel this time, but you could also use wrap and tap pliers if you have them. Pinch together the base of the heart. I like the look of one bump being a bit larger than the other and that's why one side of the metal strip was longer. The ends might not line up and that's okay. 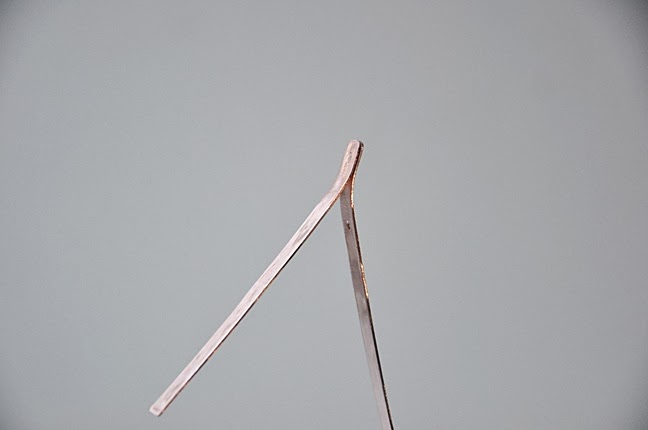 Once you have a shape you are happy with, trim the longer end. Punch a hole through both pieces of metal about 1/8" from the end. Make another rivet here to hold the two ends together. I decided I wanted to round off the end cut on this piece. I cut, filed, and sanded until it took on a shape I was happy with. 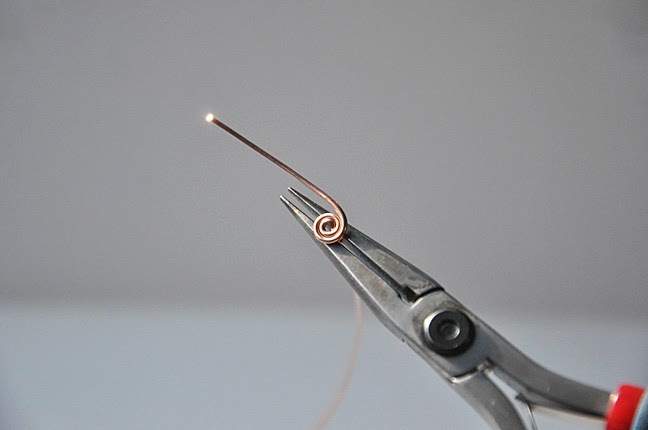 Make a flat spiral headpin at the end of a 6" (15cm) piece of 18g round wire. 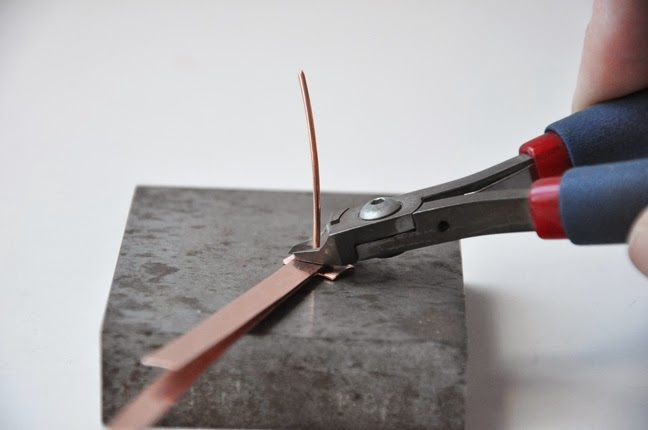 Trim the excess spiraled wire. Want a perfect spiral? Watch Beaducation's FREE class on how to make one! 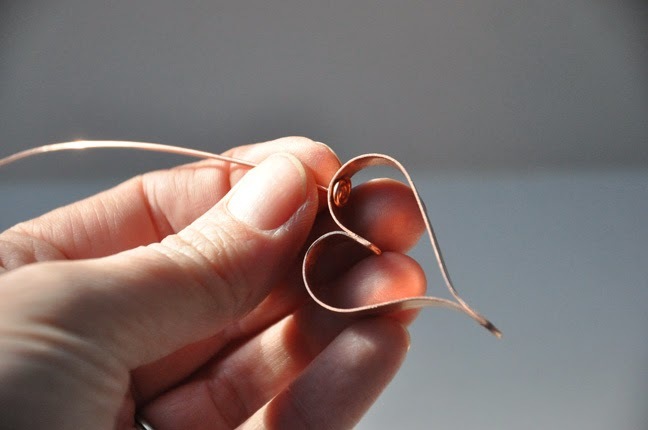 Slide the headpin through the hole in the arch of the heart. This was that extra hole you made on just one side earlier. Finish with a wrapped loop in the chunky wrap style. 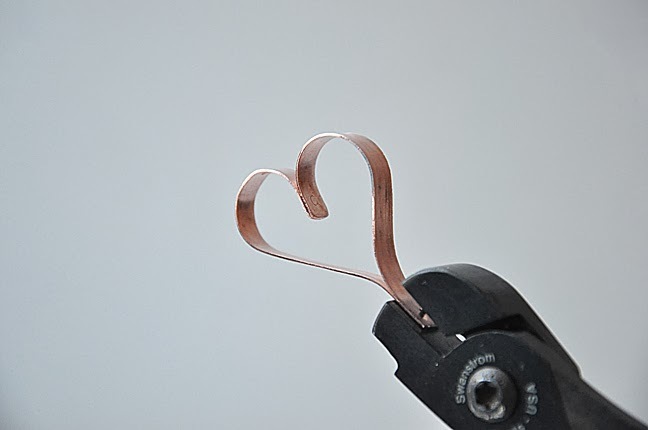 Trim the excess wire and your piece is ready for some patina! There are a lot of options when it comes to patina on metal. I feel most comfortable with recipes created with common household items. I share several patina recipes in my book, Rustic Wrappings (Interweave 2013). To get this bluish hue, I used my ammonia fume and salt water recipe. 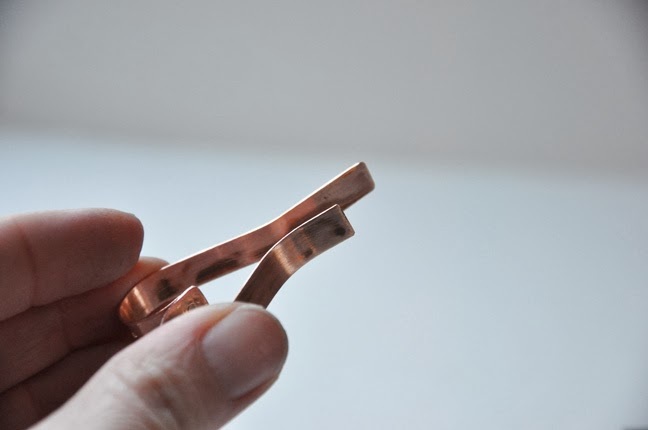 (Special note: this recipe only works on copper and brass; it will not work on sterling silver). 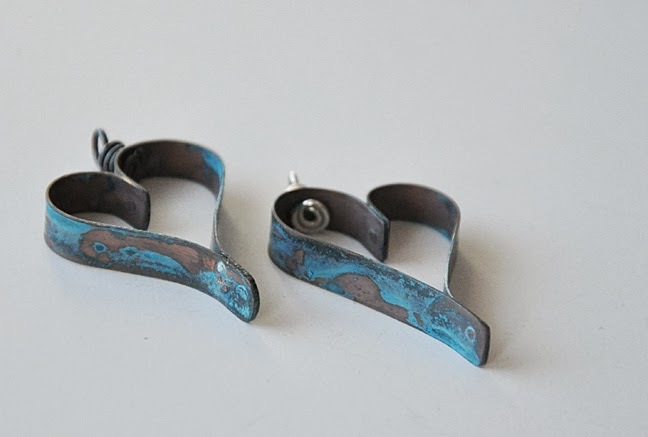 Other options are to simply oxidize the metal, enamel it a beautiful color, or you could try one of my other patina recipes from Rustic Wrappings. Put a small container inside a larger, seal-able one. Pour about 1/4 cup of ammonia in the smaller container and lay plastic mesh on top of that smaller container (I use inexpensive gutter guard). 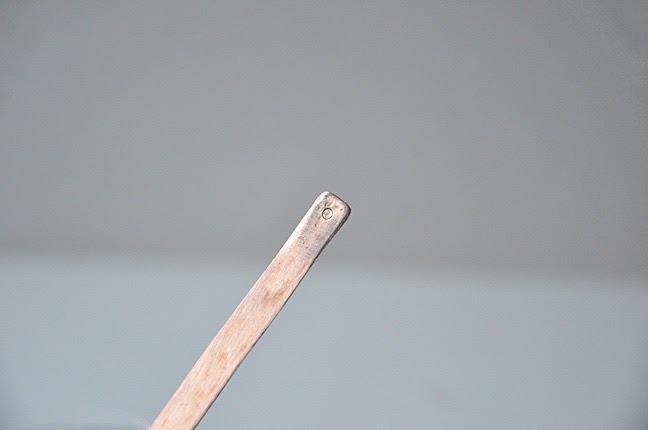 Wash your metal pieces in salt water. To do this, I pour salt into the palm of my hand, place the copper piece into the salt, and then run my hands under tap water as if I was washing them. Put the wet metal piece onto the plastic mesh so that it hovers above the ammonia. Seal the container and let set for about 1 hour. Carefully remove the pendant from the sealed container and allow to air dry. The blue will appear as it is drying (if you are feeling impatient, you could dry it with a hair dryer). The pendant will need to be properly sealed to maintain the patina. I recommend Permalac. Yes, it is a bit pricey, but it lasts for a very long time and it is formulated specifically for preserving patina on metal. Two thin layers will do, allowing time to dry between each coat. Now your pendant is ready to hang from your favorite chain!